Point-to-point hot-shot delivery service at almost half the cost.You may not have considered using a taxi to deliver your parts, parcels or even workers to a worksite, however many businesses have discovered we are as fast as Hot Shot delivery service for almost half the cost. We ship almost 300 industrial deliveries a day varying from small items to medium sized pallets in town and outside Edmonton and Western Canada. From rig and forestry sites to industrial warehouses, we have the experience to get your parcel delivered fast, professionally and safely. 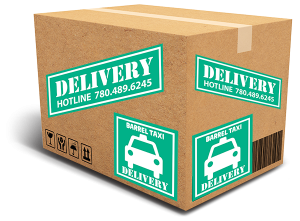 Using a Barrel Taxi to deliver your parcel out-of-town is almost half the cost of a regular hot shot courier. Your staff no longer need to run deliveries and can remain on the job boosting productivity. PUT A BARREL TAXI TO WORK FOR YOUR BUSINESS TODAY. Call our DELIVERY HOTLINE to book a delivery or to get a quote. We offer convenient payment options: cash, credit/debit, or by corporate account.